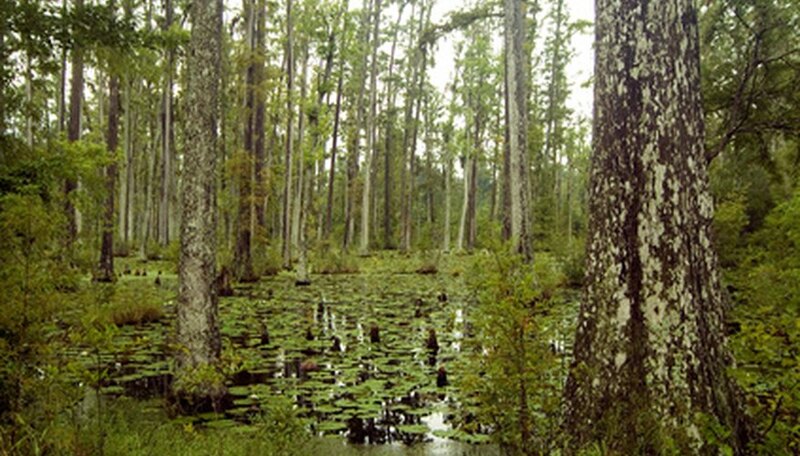 The bald cypress flourishes in areas that very few other trees find ideal: swamps, riverbanks, flood plains and any area that offers a wet, soggy depression. The tree can also be grown as a landscape tree in somewhat dry soil conditions. A deciduous tree, it does not sport typical leaves, but has needles arranged in two rows along the stems, which turn brown during the winter months. The tree will tolerate winters as far north as Maine and also flourish in the Deep South and the swamplands of Florida. Purchase year-old seedlings or container-grown bald cypress trees from a reputable nursery for the greatest planting success. The bald cypress offers amazing growth and will easily grow 2 feet per year. Prepare to plant the bald cypress tree in early spring in an area with full sunlight. The tree will thrive in soggy, poorly draining soil where other trees will perish. It will also tolerate dry, well-drained soils, but will not develop the classic knees, which are the roots bunching up at the trunk's base. Plant the tree at the same depth that it was planted in the container at the nursery, then tamp the soil down to remove all air pockets around the roots of the tree. Water the bald cypress tree daily if it is planted in well-drained soil. This tree enjoys water and cannot be over-watered. Fertilize the bald cypress tree once in the spring and once in the summer using a 10-10-10 fertilizer. Follow the directions on the label for application.